Thanks to a Kickstarter campaign and the generosity of many fans, DC based A Sound of Thunder is able to deliver their third long player, Time's Arrow. And it's massive, a crackin' good album of classic melodic heavy and power metal. A Sound of Thunder: chilling out. Everything about this album speaks to inspired creativity and quality. From sound songwriting to excellent musicianship to crisp production, ASoT excels and creates dynamic metal. The signature piece that displays all these things is the title cut. Time's Arrow is a rush of epic melodic power metal propelled by Nina Osegueda's soaring vocals and catchy lyrics, but also Josh Schwartz's fiery guitar work and ferocious rhythm section of Chris Haren (d) and Jesse Keen (b). Yet, ASoT also mixes it up with a variety tunes. There's pure heavier metal with I Will Not Break; the rock groove of the shorter Let's Start a Fire; another speedy power metal romp in Queen of Hell, the only carry over from the EP of the same name; a melodic metal duet with Blaze Bayley on My Disease; a power metal anthem in I'll Walk With You; and the groove metal of End of the Road, which has more than a little blues feel. Perhaps the only thing that's missing is the creepy Hello Nurse from the Queen of Hell EP, which would have been a bonus. You'll just have to pick up the EP if you haven't heard that one. 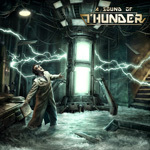 For genuine American made pure melodic heavy power metal, A Sound of Thunder is definitely keeping it true. Time's Arrow is another brilliant album. Strongly recommended.